These programs offer a breadth of research areas (including cancer, heart diseases, neurological diseases, obesity, diabetes and infectious diseases) that are well suited for students with undergraduate science degrees in Biology. All students in our biomedical science Ph.D. programsreceive a highly competitive financial package from UMMC worth more than $140,000 over the typical five years of training. This package includes a full tuition scholarship, a living allowance of approximately $24,150 per year, and medical insurance. The purpose of this support is to allow our students to focus entirely on their studies and research. As a result, our students have enjoyed great success in finding positions after completing their graduate degrees. The low faculty to student ratio at UMMC ensures that students receive the mentoring they require for success in graduate school and beyond. 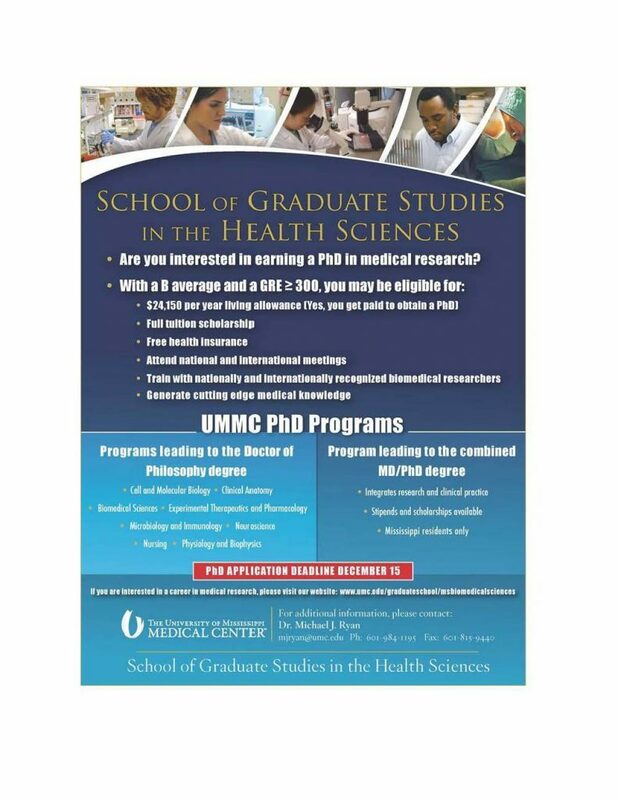 If you have students who are interested in pursuing a career in biomedical research, please let them know about our programs. For those who would like more information or to visit our campus, please contact Shanna Moulds by email (smoulds@umc.edu ) or by phone 601-984-1632. You may also wish to visit our website: www.umc.edu/graduateschool for information about a specific program. The application deadline for our programs is December 15, 2018. This deadline provides sufficient time for us to plan our recruiting weekend that will take place in February 2019. Below, please find a flyer to share with interested students, as well as a list of program highlights. We look forward to assisting graduates of University of Mississippi in the next phase of their educational training. Thank you for your time and consideration.